While Mike Stone is on the phone with his friend, he is startled by otherworldly screams. Following after these screams, an accident happens to his friend. This could be just a coincidence, but more deaths happen right after the screams, he is compelled to act on it and try to change it. But when his estranged wife is kidnapped and he hears the screams once again, his search becomes more personal. At the same time all this is happening, the police are investigated what could be a serial killer; but aren’t quite sure yet. Mark Stone is on the hunt to find his wife and win her back; but will he make it there in time before she dies with his past friends or will he make it there in time to find his wife and save her from what might happen? Mike Dellosso put together a very interesting book; you never know what is going to happen next. 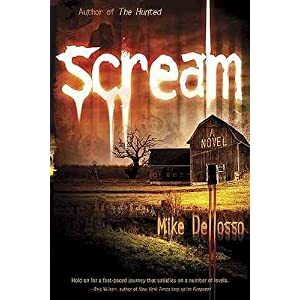 Scream is recommended to people who like mystery and suspense books. This story was very detailed all the way up to the ending; but the ending is exactly what I didn’t expect. Mike is a very good writer and I plan on reading some other stories he has written.